This being December, it is renewal time and despite the best efforts of Royal Mail we can still hold our UK subscription unchanged. The fall of the $ means that payments in this currency need to be increased but there is the option to use Euro, where rates are unchanged. If everybody who intends to renew does so without a reminder the current rate could even continue into 2006, as reminders are actually our main variable cost. 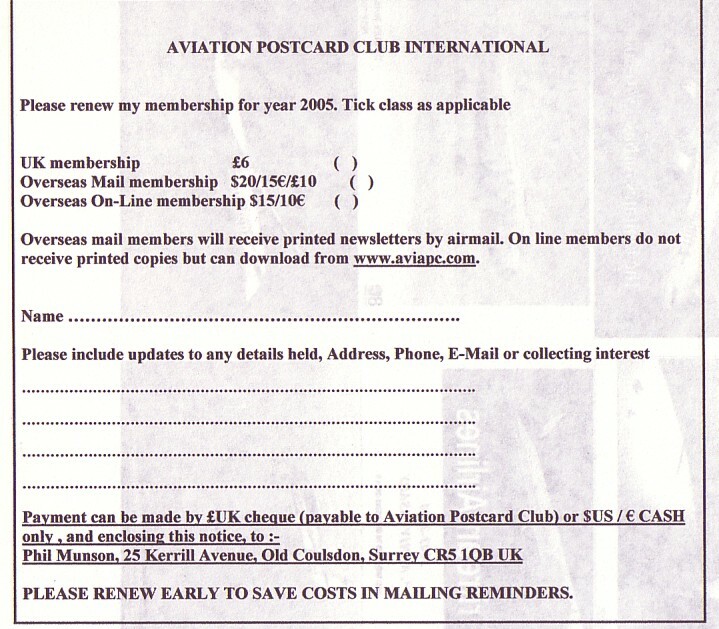 As an added incentive, I do hope to get something published on Concorde cards in 2005. Ray Billings continues to contribute to Picture Postcard Monthly. His article on the 1934 Melbourne race actually used the same KLM DC-2 crew card as we featured in Flying Dutchmen last time. We had some enquiries for new members but none actually signed up, so we can expect numbers to drop again this year through fading interest or health of members. Perhaps the collectors club, as an idea for pooling information is itself on its way out, being replaced by Internet searches. I must admit to using this device to add information about card subjects in this issue. Having said that we have had a contact from the Football Card Collectors Club so we are not alone (see What Do you know). Meanwhile all the best for Christmas, any other seasonal quasi-religious festivals and the new year.